Theranostics, 2018, 8(5):1270-1285. SB225002 purchased from Selleck. The inhibitor SB225002 significantly decreased J82-, CXCL2- or MIF-mediated MDSC migration. The bars represent the s.e.m. of three experiments. *P<0.05. 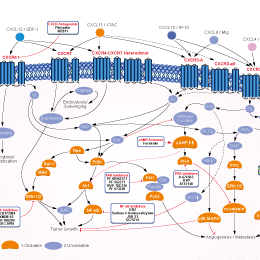 Oncogene, 2017, 36(15):2095-2104. SB225002 purchased from Selleck. SB225002 could inhibited h-JBMMSCs chemotaxis in both the co-culture and the monoculture transwell systems (n = 3; *P < 0.05). J Cell Mol Med, 2017, 21(7):1411-1419. SB225002 purchased from Selleck. (e, f) Administration of the selective CXCR2 antagonist SB225002 mitigated mechanical hyperalgesia and heat hyperalgesia in CCI rats. Antinociceptive effects of a single intrathecal (it.) injection of 20 µg SB225002 were observed at 1 h and disappeared at 2 h. Antinociceptive effects induced by a single injection of SB225002 at 40 µg were observed at 1 h and disappeared 6 h after injection. Injection of SB225002 (10 µg, i.t.) did not alter the PWT and PWL of CCI rats. N = 6 rats for each group, *p < .05, compared to NS group. PWL: paw withdraw latency; PWT: paw mechanical withdrawal thresholds. Mol Pain, 2016, doi: 10.1177/1744806916646381. SB225002 purchased from Selleck. Assays are performed in 96-well microtiter plates where the reaction mixture contains 1.0 μg/ml membrane protein in 20 mM Bis-Tris-propane, pH 8.0, with 1.2 mM MgSO4, 0.1 mM EDTA, 25 mM NaCl, and 0.03% CHAPS and SB 225002 (10 mM stock in Me2SO) added at the indicated concentrations, the final Me2SO concentration is <1% under standard binding conditions. 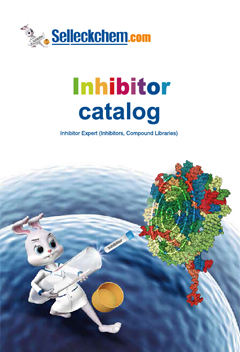 Binding is initiated by addition of 0.25 nM 125I-IL-8 (2,200 Ci/mmol). After 1-h incubation at room temperature the plate is harvested using a Tomtec 96-well harvester onto a glass fiber filtermat blocked with 1% polyethyleneimine, 0.5% BSA and washed three times with 25 mM NaCl, 10 mM Tris·HCl, 1 mM MgSO4, 0.5 mM EDTA, 0.03% CHAPS, pH 7.4. The filter is dried, sealed in a sample bag containing 10 ml of Wallac 205 Betaplate liquid scintillation fluid, and counted with a Wallac 1205 Betaplate liquid scintillation counter. Method: Three esophageal squamous cell carcinoma cell lines WHCO1, WHCO5, and WHCO6 originally established from surgical biopsies of primary esophageal squamous cell carcinomas are cultured in DMEM containing 10% FCS at 37°C in a humidified atmosphere of 5% CO2. MTT assays are carried out using the Cell Proliferation kit I. Briefly, 1.5 × 103 cells are plated in 96-well plates in a final volume of 180 μL DMEM per well. SB 225002 (antagonist of CXCR2, 400 nM) is added to cells and 0.001% DMSO (solvent) is added as a control. After the indicated incubation period, 18 μL of the MTT labeling reagent (final concentration 0.5 mg/mL) is added to each well and incubated for 4 hours in a humidified atmosphere. One hundred eighty microliters of the solubilization solution are added to each well and the plates were left overnight at 37°C. The spectrophotometric absorbance of samples is measured at 595 nm using a microtiter plate reader. White JR, et al. J Biol Chem. 1998, 273(17), 10095-10098. Wang B, et al. Cancer Res. 2006, 66(6), 3071-3077. Goda AE, et al. Biochem Pharmacol. 2013, 85(12), 1741-1752. Sueoka H, et al. Surgery. 2014, 155(4), 640-649. Manjavachi MN, et al. Eur J Pain. 2010, 14(1), 23-31. Bento AF, et al. J Leukoc Biol. 2008, 84(4), 1213-1221. Whether the in vivo formulation for the drug: 2% DMSO/castor oil is a clear solution for injection or a suspension for oral administration? S7651 can be dissolved in 2% DMSO/castor oil at 10 mg/ml as a clear solution and it is a suspension in 2% DMSO/30% PEG 300/dd H2O at 5 mg/mL. BAF312 (Siponimod) is a next-generation S1P receptor modulator, selective for S1P1 and S1P5 receptors with EC50 of 0.39 nM and 0.98 nM, exhibits >1000-fold selectivity over S1P2, S1P3 and S1P4 receptors. Phase 3. Fingolimod (FTY720) HCl is a S1P antagonist with IC50 of 0.033 nM in K562, and NK cells.